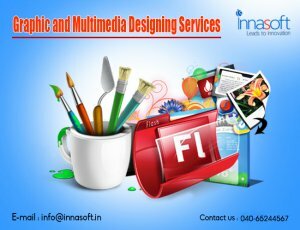 Innasoft at Vijayawada & Hyderabad offers integrated graphics and multimedia designing solutions to increase your web identity in online world. We use very professional images and colors for your new or existing website. We have a pool of experienced professional multimedia and graphic designers who create impressive graphic and multimedia designs. Our services include designing podium designs, logos, magazine ads, brochures, campaigns, email designs, website designs, event banners and promotional banners. Our graphic designs give you an eye catching look and promote your business growth in short time. We deliver the final output with the combination of creativity, communication and usability. We design tailor made solutions for different platforms like desktop applications or any other software systems.